On Friday 19 April 2019, Barotse activist Mukwae Wabei Siyolwe will present her artistic project "Wade in the Water" in Pittsburgh, Pennsylvania, United States. In what she describes as a "hybrid multi-generational archival encounter", the artistic producing director of Global Posse productions pays tribute to her great grandfather King Lewanika of Barotseland, using photographs, a documentary, music and performances. 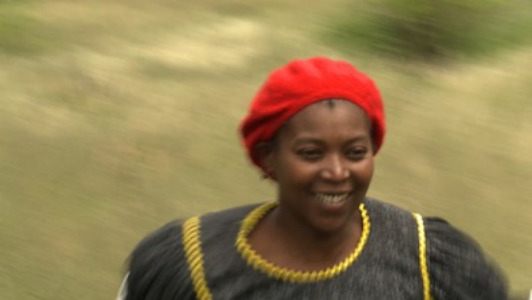 This project explores both her indigenous Barotse and her western identities. After a first presentation in Mexico in September 2017, her project has travelled across several countries and will come back to Mexico in May of this year. Come to higher ground in a one hour participatory ritual drama animating an archive of emotions and photographs with hybrid artist Princess Mukwae Wabei Siyolwe, in a solo performance where indigenous and western identities collide on a multi-generational journey of the revolution in Barotseland towards self-determination through an ancient ceremony called Kuomboka- to wade in the water. Hybrid Artist Wabei Siyolwe is a 35th generation Mukwae (Princess) of the Luyana Dynasty of the Kingdom of Barotseland and the founder and artistic producing director of global posse productions, inc., a non-profit founded in Namibia in 1992 that uses visual and performance arts media as vehicles for social transformation. As a graduate of the Guildhall School of Music and Drama, London, she has starred in Mass (Barbican Centre, London) directed by Leonard Bernstein, co-starred with Denzel Washington in the Oscar nominated film directed by Richard Attenborough Cry Freedom (Universal), Nuns on the Run (Handmade Films), The Crossing (BBC TV). London West End musicals include King (Piccadilly Theatre), and many international UK, US and world productions. Her award winning directing credits include The Island which she won a Best of Pittsburgh Award. She is a contributor to Afrikadaa, a Paris based online bi-lingual art and design journal and writes her own blog called Cherry Ripe: Chronicles of a Rebellious Princess. She is a Virginia Hero of the Arthur Ashe Foundation and a recipient of multiple awards that include a Lifetime Achievement Award for her work on Cry Freedom from the TAZAMA Film Festival. Mukwae Wabei is the Chairperson of the Diaspora for Barotseland at the Unrepresented Nations and Peoples Organization (UNPO), Brussels. Funding for Wade in the Water Project was provided by the Advancing Black Arts in Pittsburgh Program, a partnership of The Pittsburgh Foundation and The Heinz Endowments, The Pittsburgh Foundation A.W.Mellon Educational and Charitable Trust Fund, The Heinz Endowments Small Arts Initiative, Fundacion Legorreta Hernandez, with the support of BOOM Concepts, The Greater Pittsburgh Arts Council, Unrepresented Nations and Peoples Organization (UNPO), Paris Missionary Society (SMEP), Barotse National Freedom Alliance (BNFA) ,and the board members and friends of global posse productions, inc..
For more information, you can download the press release by clicking here.